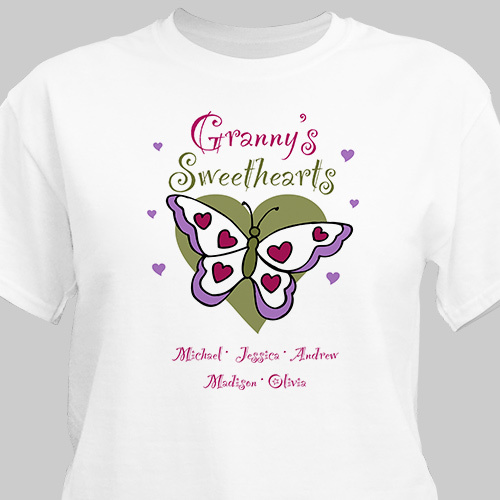 Grandma's little sweethearts are sure to fill her heart with love & joy every time she proudly wears her Sweetheart Personalized T-Shirts. This Personalized Shirt makes a perfect gift for Mother's Day, Grandparents Day or special Anniversary. Your new Personalized Gift Shirt is available on our premium white 100% cotton T-shirt, machine washable in adult sizes S-3XL. T-shirt is also available in Pink or Ash Gray. Includes FREE Personalization. Personalize your Sweetheart T-shirt with any title & up to 30 names. I love the color and picture is great!!! It would look nicer if the ugly green color wasn't in it. Wish I would have looked closer.